MOSCOW (AP) — A clash with "terrorists" in eastern Syria killed four Russian soldiers and wounded others, the Russian Defense Ministry said Sunday. 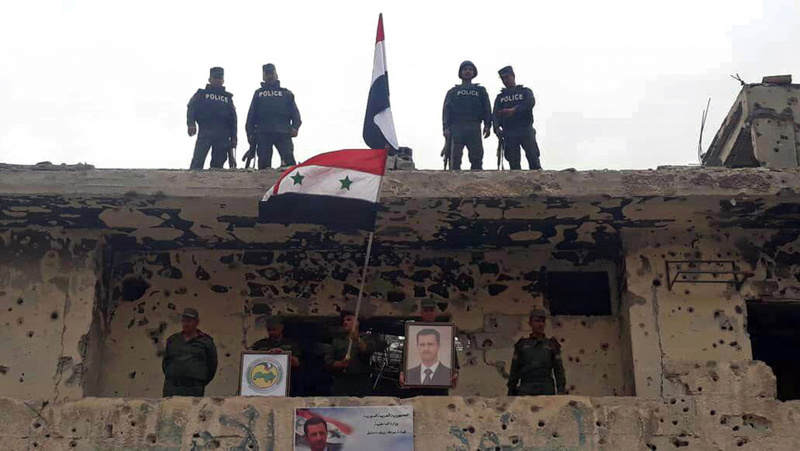 Russian and Syrian government troops and pro-government gunmen have been fighting members of the Islamic State group in the eastern province of Deir el-Zour where the extremists resumed their attacks against government forces and their allies in recent weeks. In a statement reported by Russian news agencies, the ministry said "two Russian military advisers, who controlled fire of the Syrian battery, died at the scene." It says five others were wounded, two of whom died in a Russian military hospital. The Britain-based Syrian Observatory for Human Rights, a war monitor, said IS fighters launched two new attacks in Deir el-Zour on Saturday near the town of Mayadeen and the town of Boukamal near the Iraqi border. The Observatory said five days of fighting in Deir el-Zour killed 76 troops and pro-government gunmen as well as 25 IS fighters. Russia has provided crucial military support to President Bashar Assad's forces, helping them to roll back mainstream rebels as well as the Islamic State group. Russia and Syria both refer to the armed opposition as "terrorists."